Absolute purchase obligation in the price segment. beautifully matured malt - sherry balance fits, neither too red nor too bitter, even the power is perfect for me - without water. He is more spicy - without getting woody - than overly fruity - I think he does not meet the taste of any Sherryfan - rather the more experienced sherry friend the simple red fruit cocktail long ago boring and likes Malts with corners and character. Starts floury dusty - takes time in the glass to unfold. Complex and complex. This spicy sherry bottling is characterized by dark fruit and wood aromas and is due to its spicy and "idiosyncratic" aroma composition not necessarily comparable to other "sherry bombs". The musty and musty base note in the nose and in the taste is fascinating and gives this filling in combination with spices and herbs a special character. Somehow different, but saulecker! Strong and creamy amber shines slightly turbid from the Premium Snifter, while immediately discreet musty and musty sherry flavors noticeable. Dark fruit flavors such as dried orange slices, old raisins and dried PX berries end in creamy milk chocolate and sweet honey. Caramelized sugar and dusty cinnamon sticks stick black currant and dried peach, a touch of leather and sweet tobacco leaves give the fruity and sweet nose a wonderfully tart and spicy touch. Christmas spices and gingerbread are perfect for the cold season and the dark fruit flavors. Blackberries and black sour cherries complement each other beautifully with plums and dates, the flavors change every second. In the background is still the initially perceived musty and slightly musty note which gives this Inchgower additionally a special character. Musty and musty, the first greetings sip flows over the tongue, immediately followed by dark fruit flavors and spicy wood tones. An intense spicy note is above all, thyme, meadow herbs and Christmas spices are distributed throughout the mouth and dress it with chubby warmth. Chocolate, oranges, cherries and raisins are supported by sweet honey and fresh mint. Also in the taste I take a minimum sulfur note in the form of muff and moder was. Anyone who knows me knows that I am "allergic" to sulfur, but at the moment I do not find these flavors disturbing but rather enriching. Old mint refreshes the palate, creamy walnuts float on the tongue, spicy and decayed wood elements rest on the palate. With a cozy warmth and tart basic aromas, the taste fades away and blurs with the finish. Long stick warming and spicy aromas on the palate. Tart, slightly dry wood tones dissolve, dark oranges and cherries end in dates and raisins. Sweet chocolate and liquid forest honey mingle, the refreshing mint note still sticks to the palate. 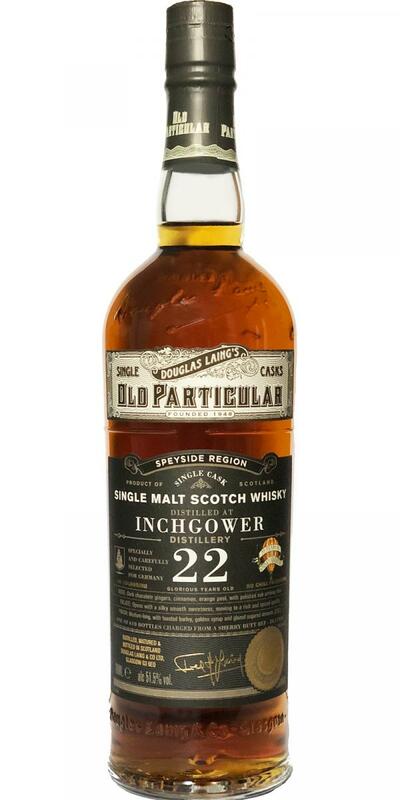 Hazelnuts and minimal leather aromas leave spicy sweetness and creamy caramel after fading away. Here and there a hint of smoke and roasted aromas flare up, in the end I do not take any musty and musty elements any more. Definitely NO SULPHUR in this one! Really fantastic stuff. 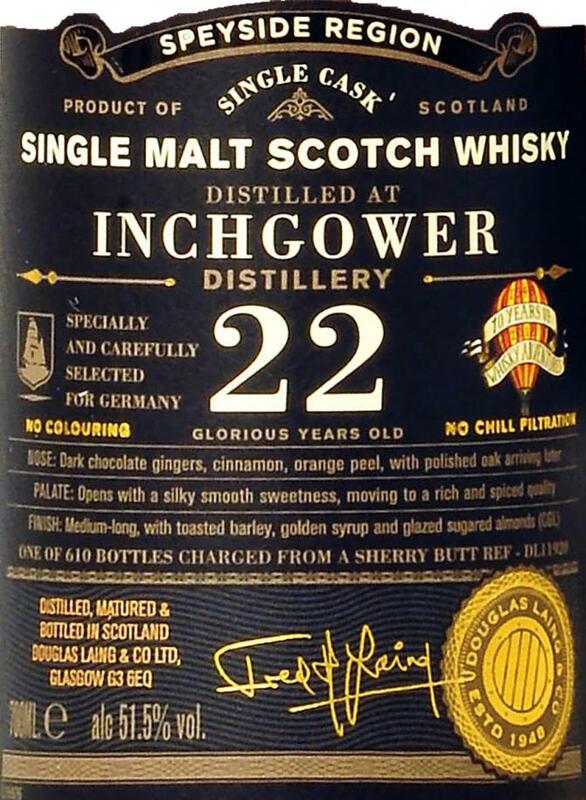 I was incredibly surprised, also because Inchgower first came to my attention with the latest special releases. Short comparison - also priced. The special release stayed on the shelf, here I accessed. Clear purchase recommendation - awesome! ...at the first sniff I catch some sulphurous aromas (fireworks) but this vanishes quickly and a bold modern sherry profile develops that is fine but to be honest: I had better ones before... During the mouthfeel and on the palate the sulphur is back (you know, this scurfy-astringent coating that I do not like at all). No, this dram is not extremely sulphurous but it is significant, definitely and everyone who is sensitive to the smell of hell should rather shy away from this bottling... All others, enjoy! Right after serving the sulphur is strong but this vanishes quickly after some breathing. Nice bold sherry flavours again but the sulphur grows stronger towards the end. No, I am not a hell boy! This whisky actually has everything the sherry friend likes without sulfur allergy: intense sherry flavors, oak, plum, cinnamon and match sulfur. Fassstark, matured for 22 years, reasonably priced. And sold out again; no wonder. Ok, sherry barrel, oak, juicy apricot. Some plum roaster. From the background come, next to the oak, a few matchheads. The cask strength announces itself with a typical Mentholhauch. And again plum roaster, now with some cinnamon. Fine-spicy, sherry-stressed. In the mouth, the malt comes pleasant sherrytief and Zwetschkenroesterbetont, followed by the oak and the burned matches. Also on the palate, the 51.5% are beautifully integrated, the whole results in a fine-oily mouthfeel. In the medium-long to long finish, the malt remains faithful to its sherry-accented line of oak and light sulfur spice. To the plum roaster with cinnamon comes a few earthy notes. Keeps what the color promises: pure sherry in all facets from a completely clean barrel without any junk marks. As described here several times while more on the (spicy) chocolaty side. Ground and balanced. Very tasty, good PLV, for me, however, should also be a little more fruit and volume there.